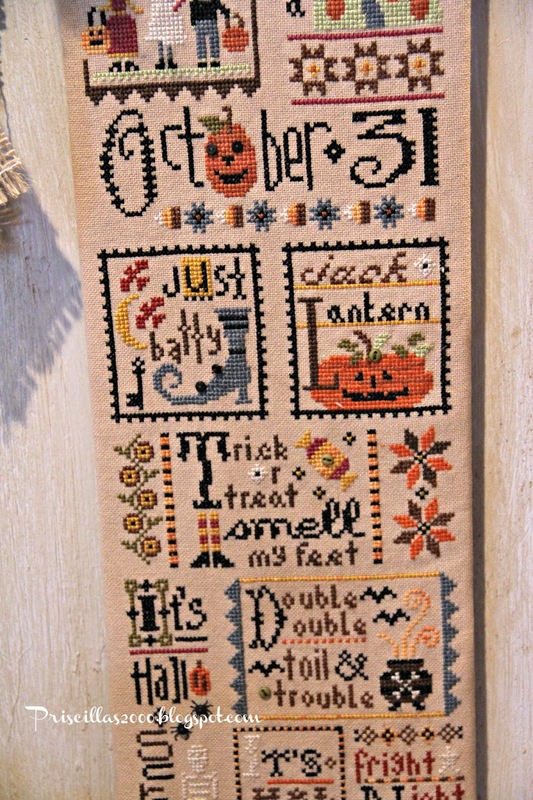 I am excited I actually finished this before Halloween ! 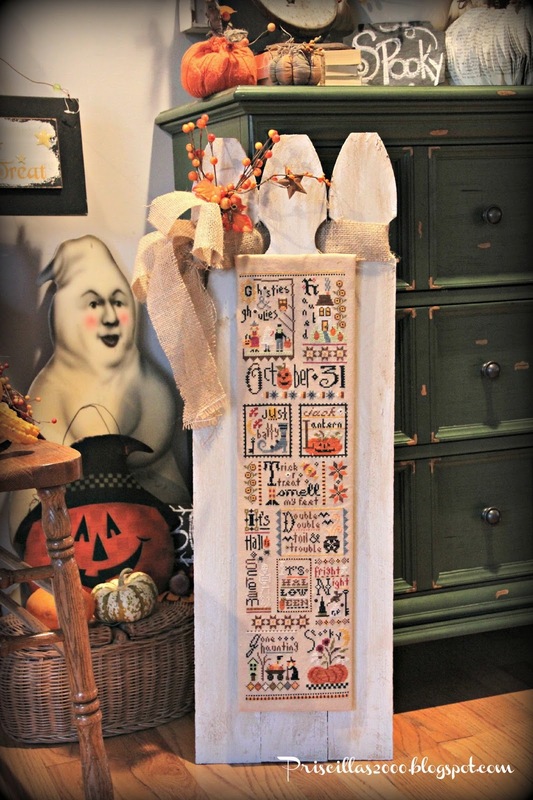 This is the collection of Lizzie Kate Tingles patterns ..I had this idea to display it on picket fence boards and it actually looks cute ! 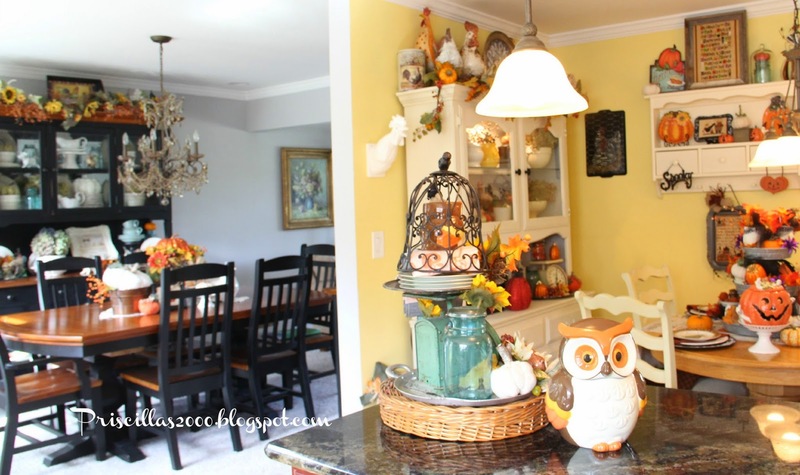 I painted the fence light gray then used brown stain over the top.. 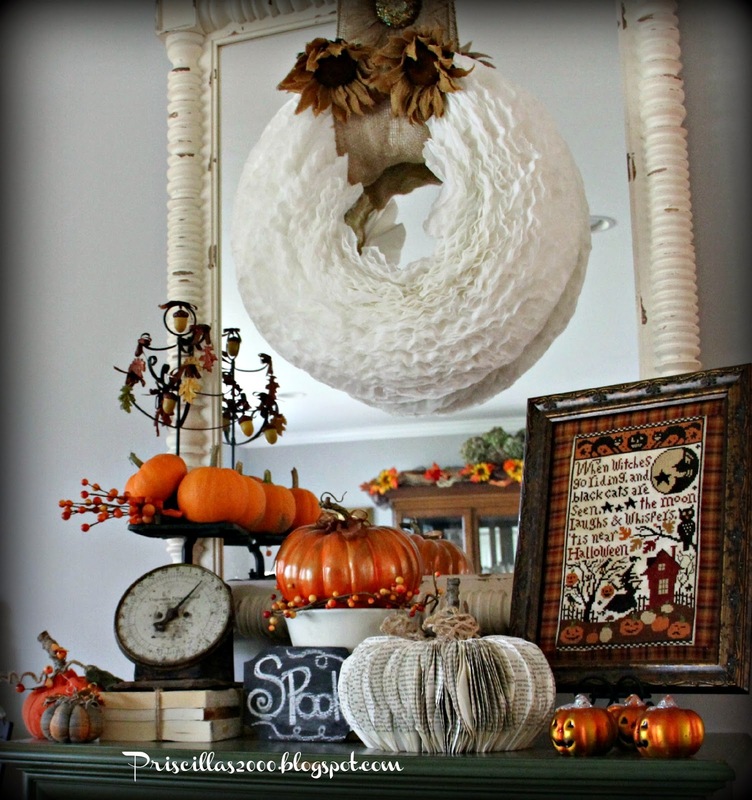 I added a burlpa piece threaded throught the panels and a burlap bow with some Fall berries.. 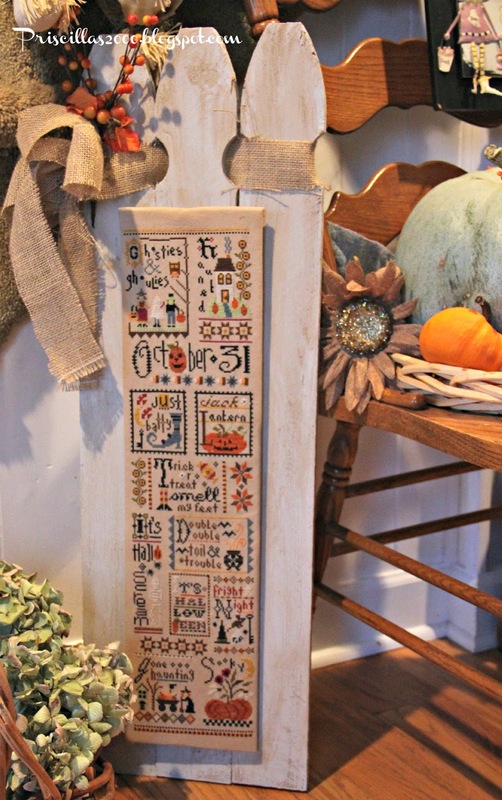 This is a big long stitching piece , and I am really not into frames on the wall.. 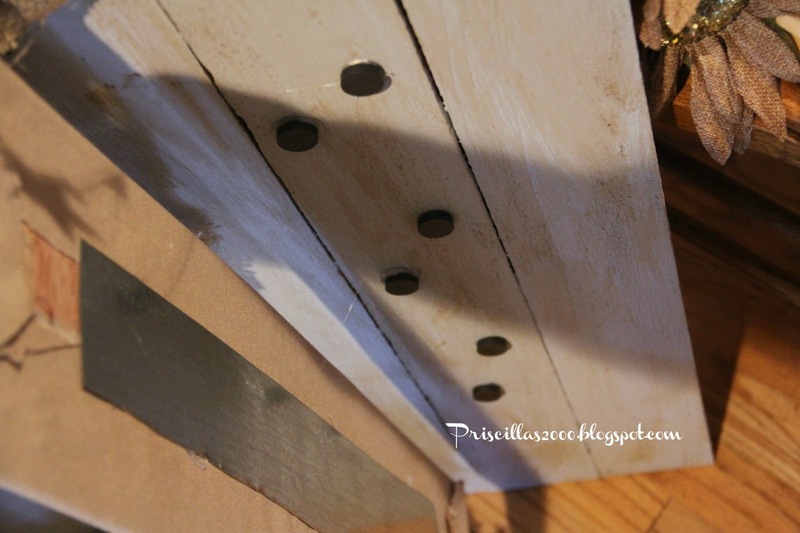 So I got 3 picket fence pieces from Home Depot.. used 2 small pieces of wood across the back to hold them together with screws. 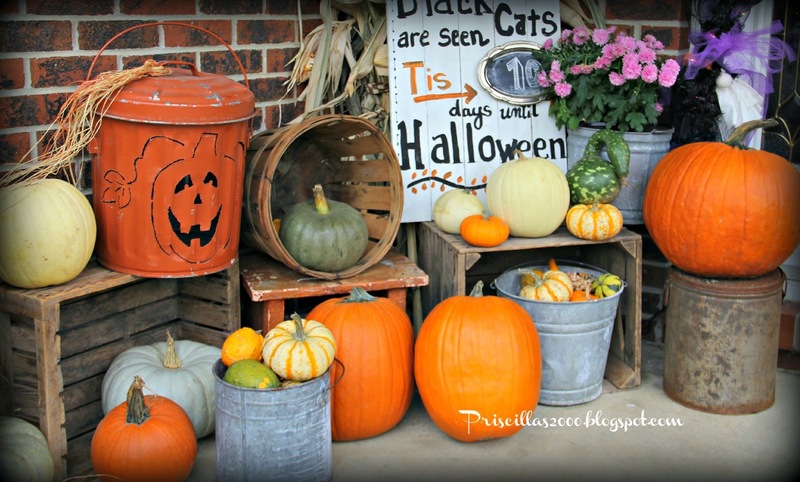 I had the nice man at Home depot cut about 5 inches off the bottom of each fence piece.. 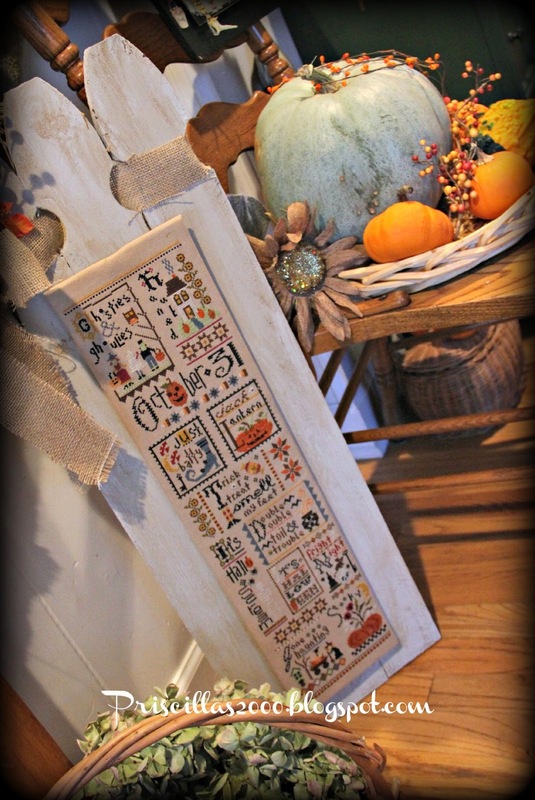 I also bought a thin piece of wood that he cut to the size I needed to mount the stitching on. 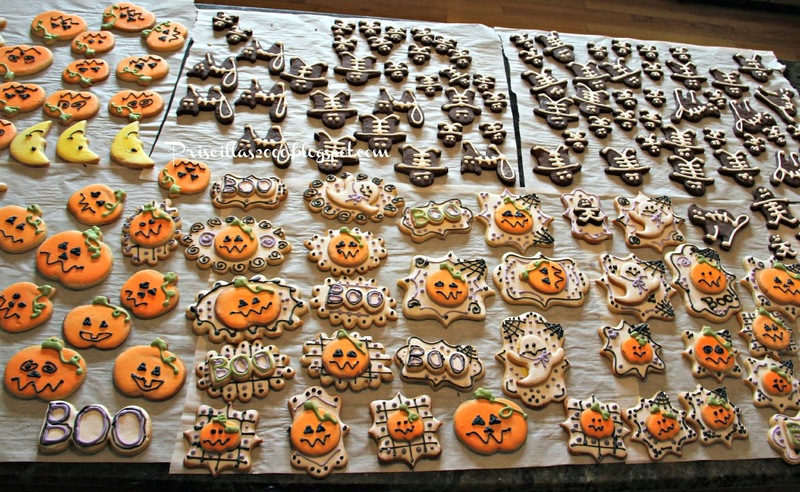 All of this was under $12.00 and I still have a big piece of the thin wood left . 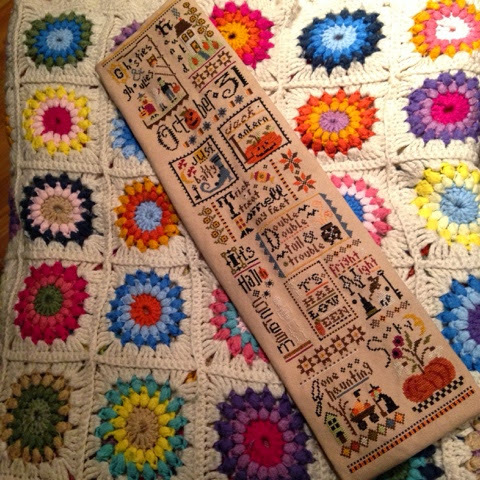 Right now its in the foyer ..not sure where it will end up.. 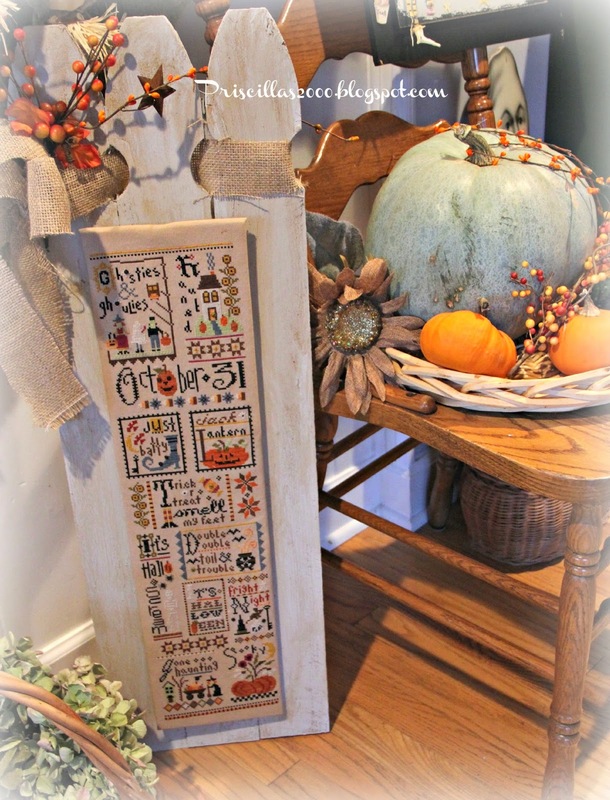 I used magnets on the wood and a long piece of sheet metal on the back of the stitching. 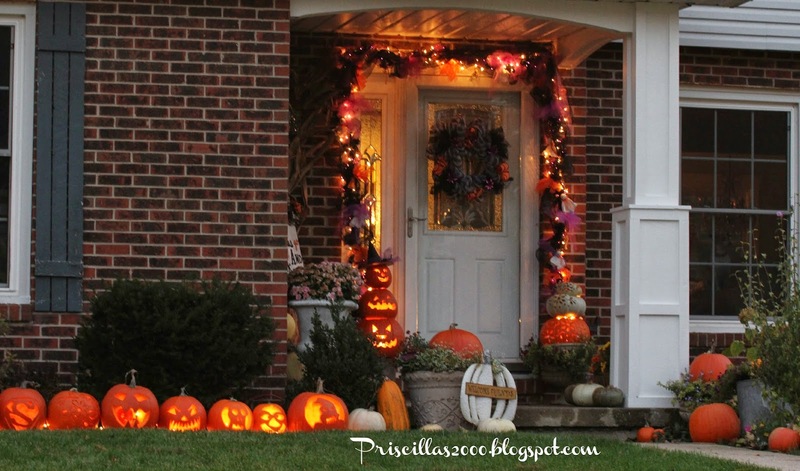 I have the Christmas Lizzie Kate patterns that I hope to get stitched before Christmas so I can use the fence for both ! 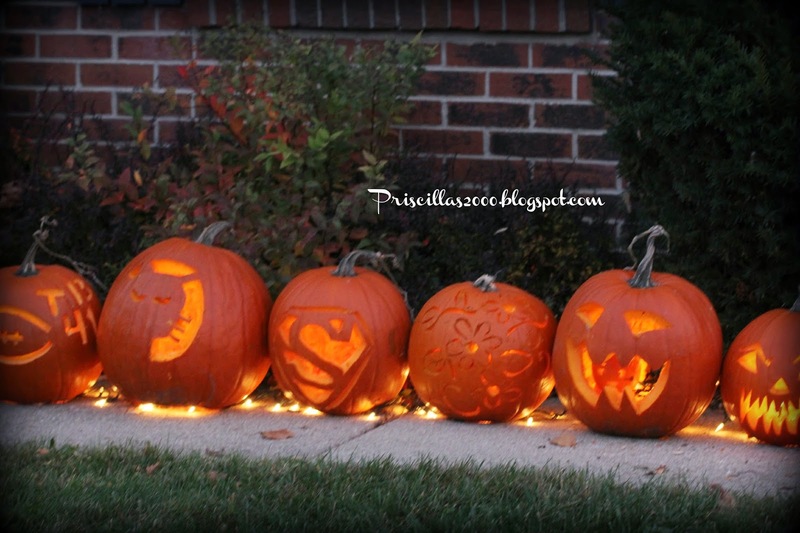 I love how it turned out ! 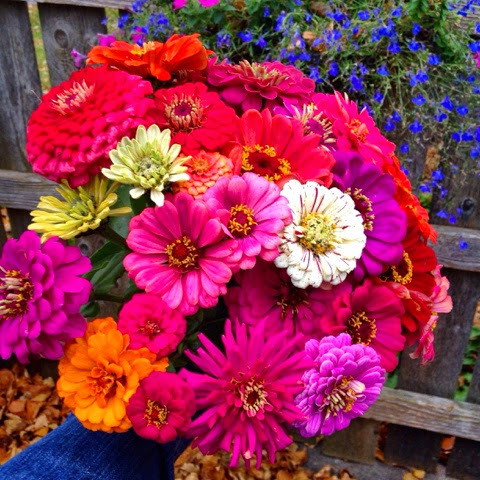 Yesterday these zinnias came out of my garden .. 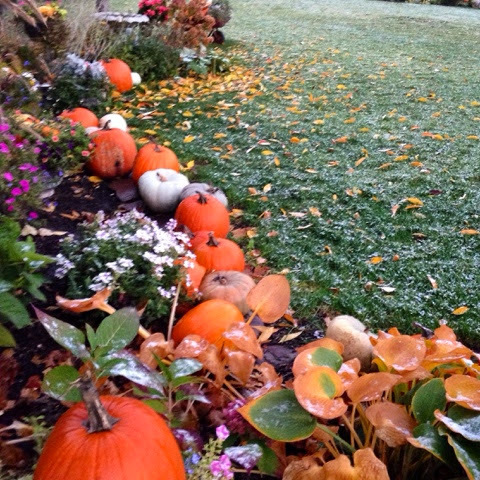 This morning there were snow flurries ! 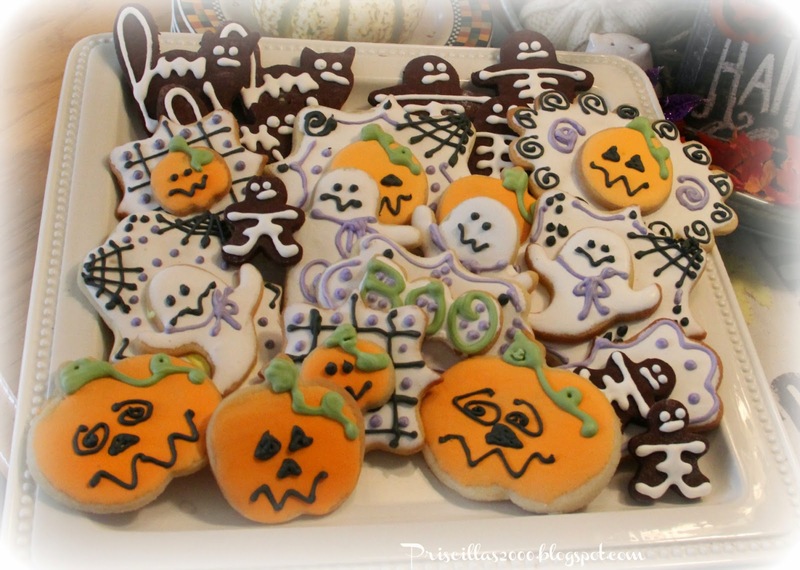 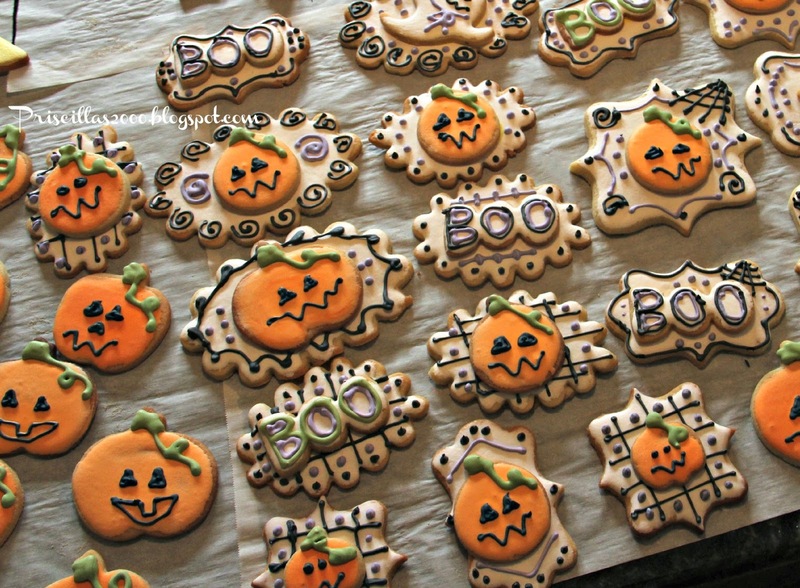 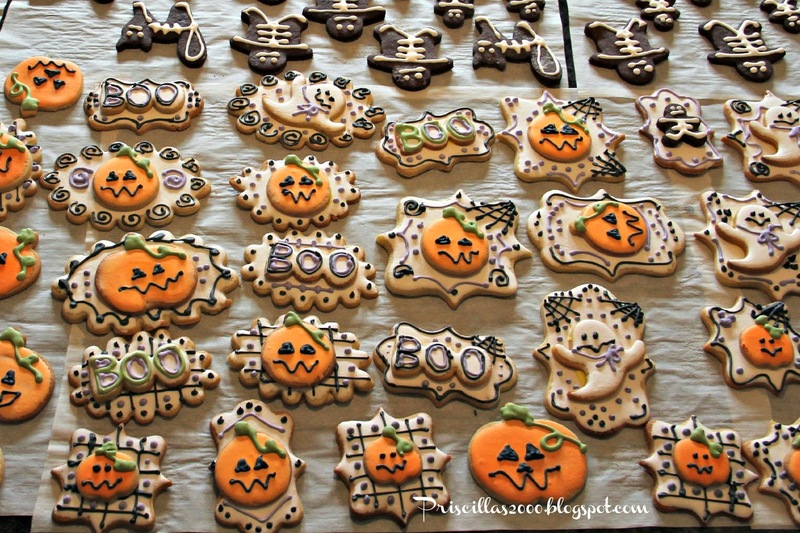 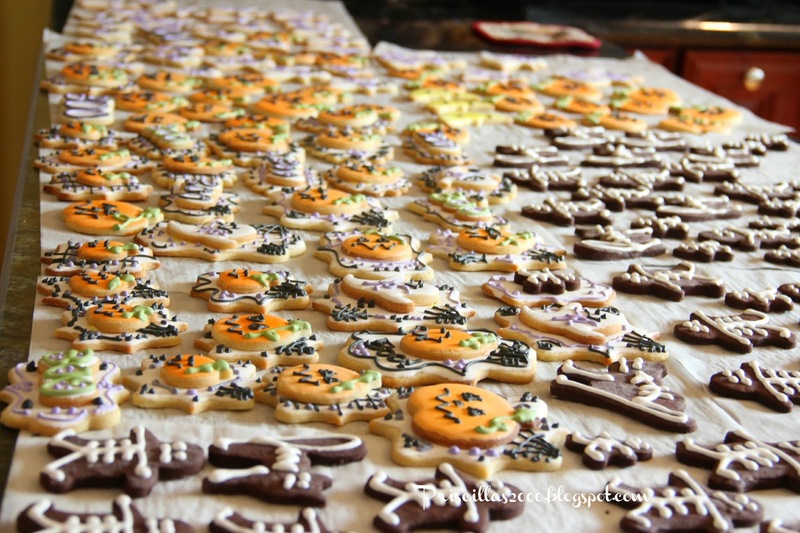 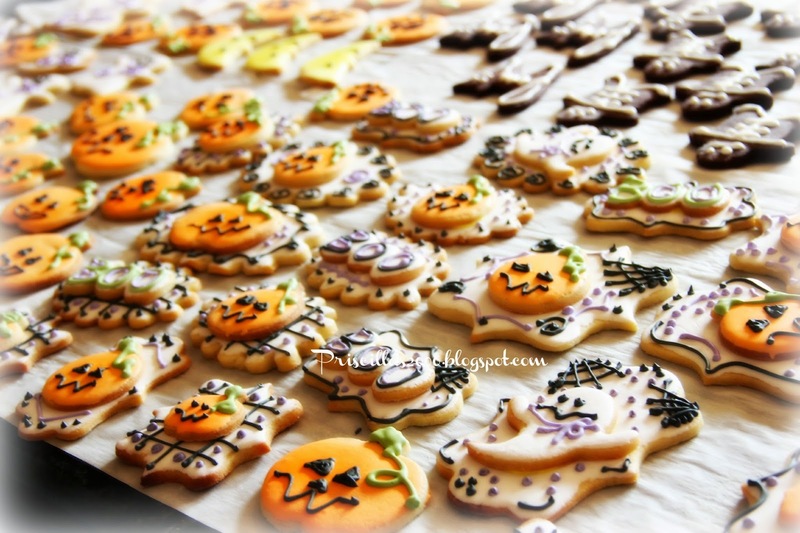 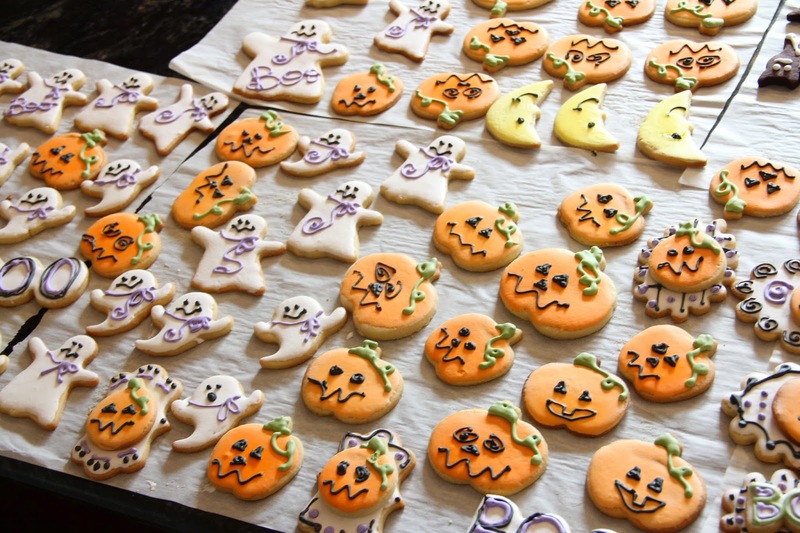 The Halloween cookies are baked ! 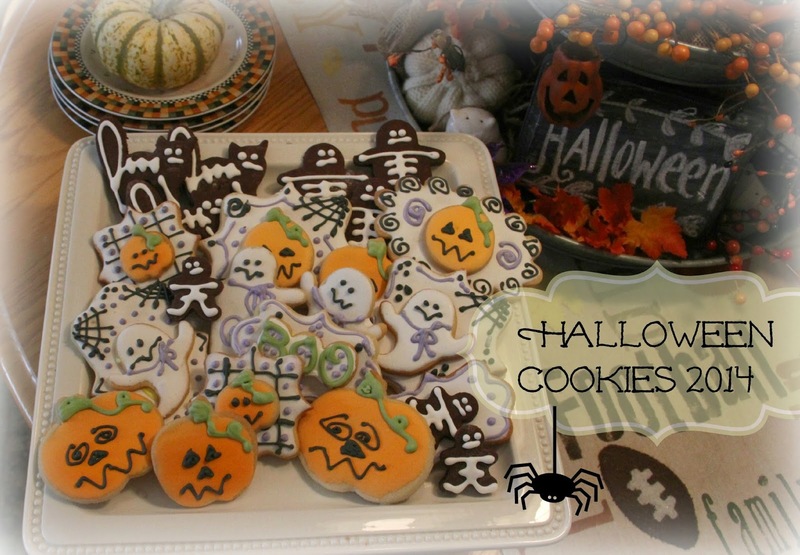 I use Mrs. Fields sugar cookie recipe , and Martha Stewarts chocolate sugar cookie recipe . 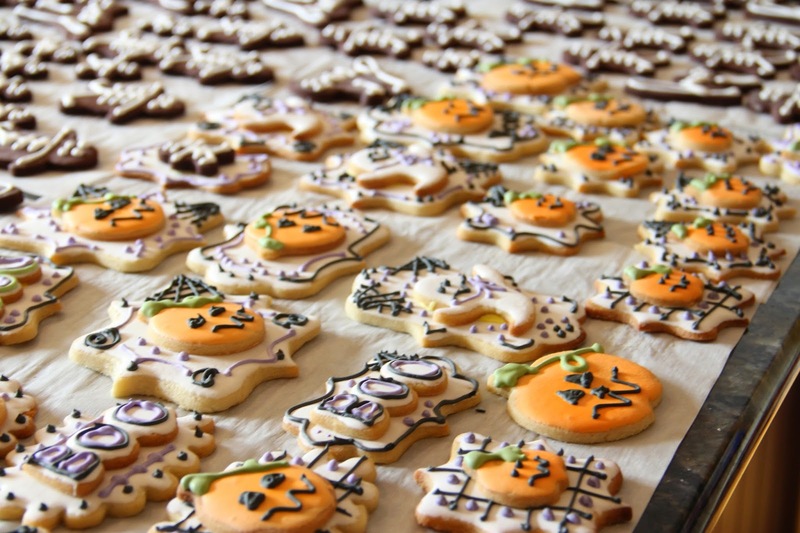 Royal icing for the frosting. 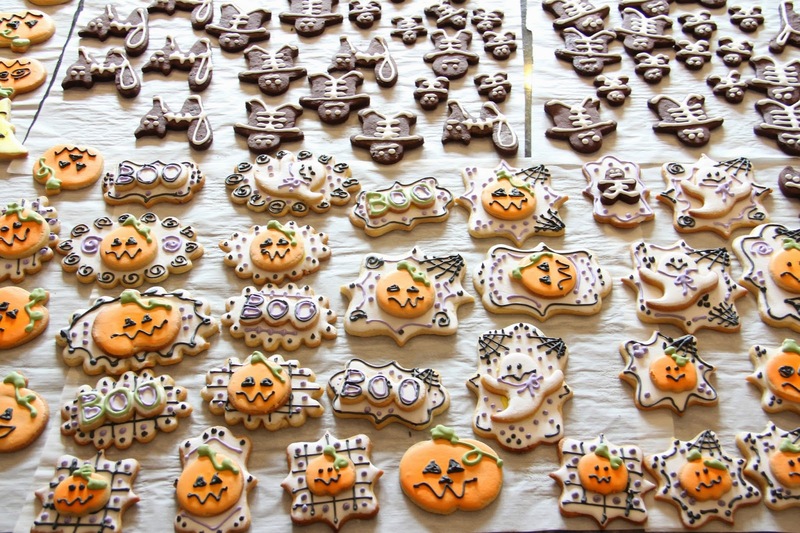 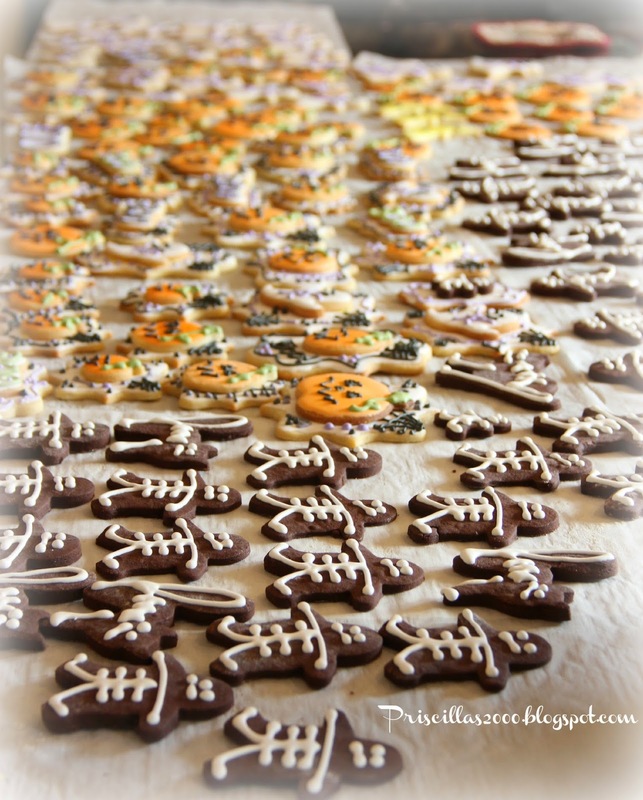 Chocolate sugar cookie skeletons and cat skeletons..
Only 3 more days til Halloween ! 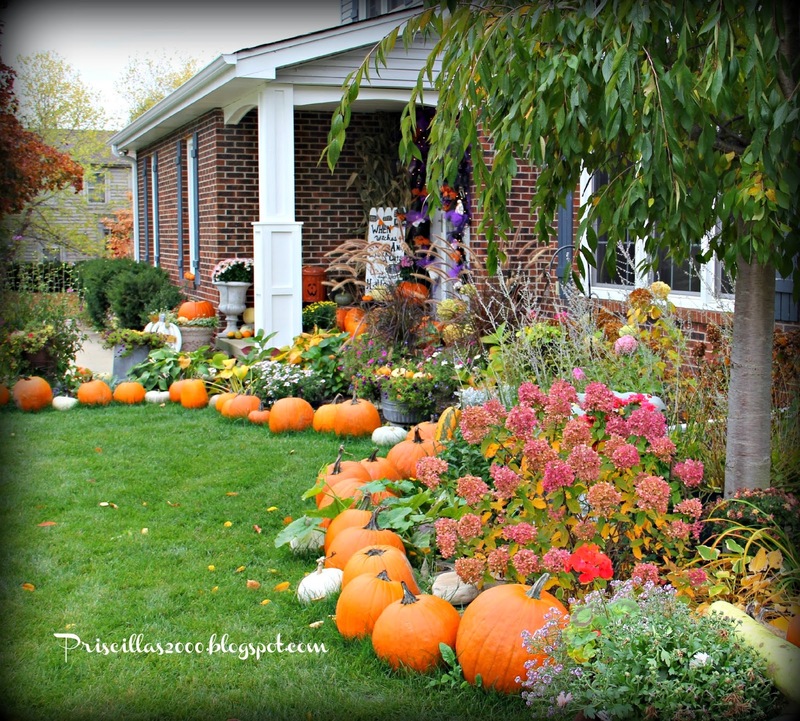 Here is my Halloween Tour for this year ..We still have a ton of pumpkins surrounding our flower beds.. 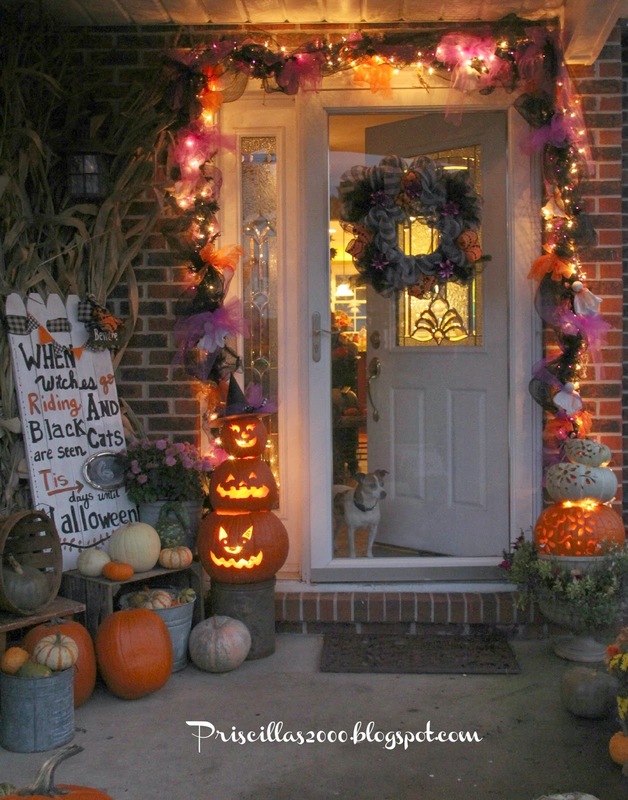 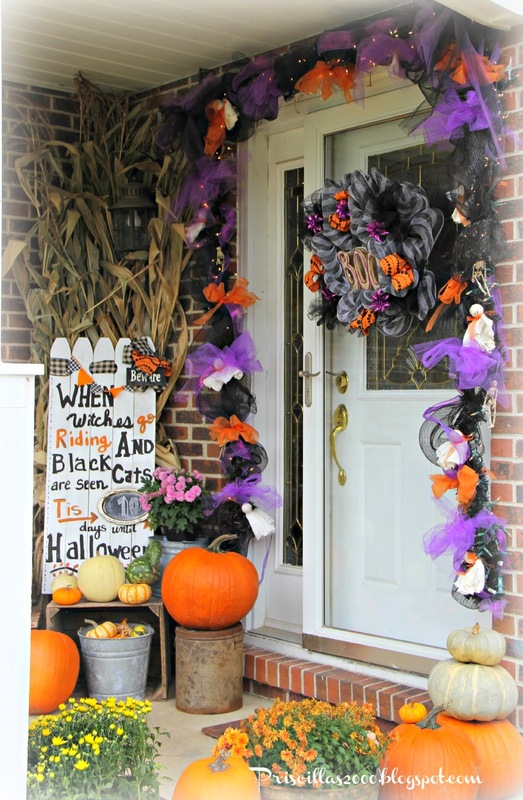 The front porch is decorated with a decomesh garland and wreath.. A DIY Halloween picket fence countdown is on display. 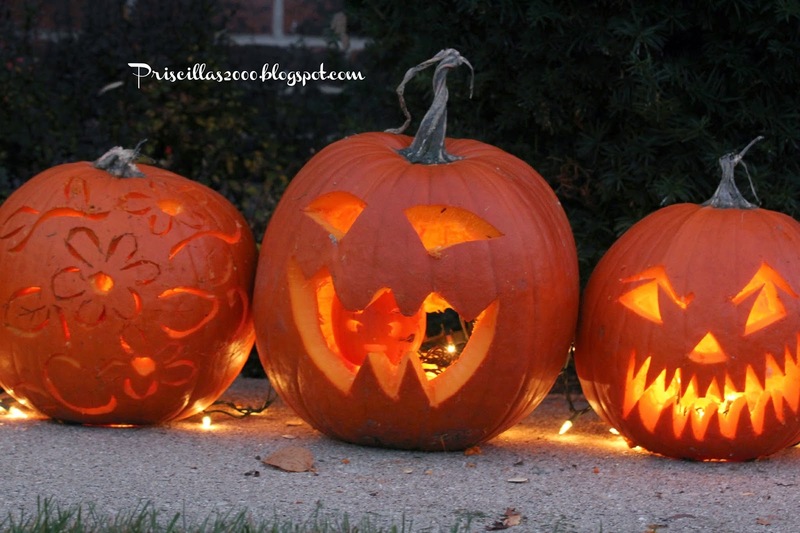 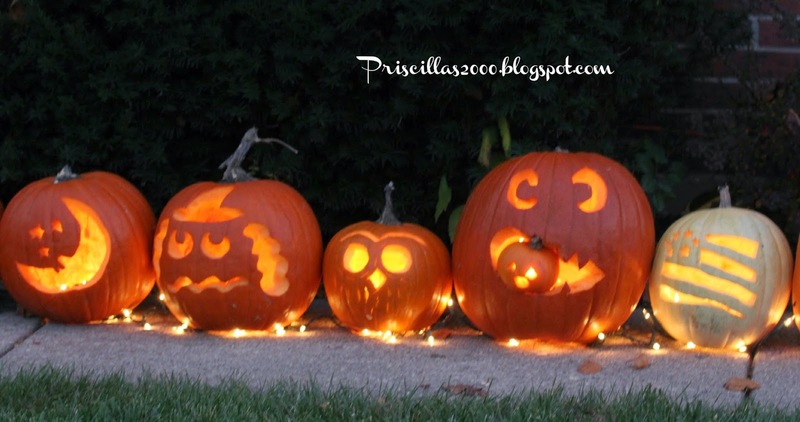 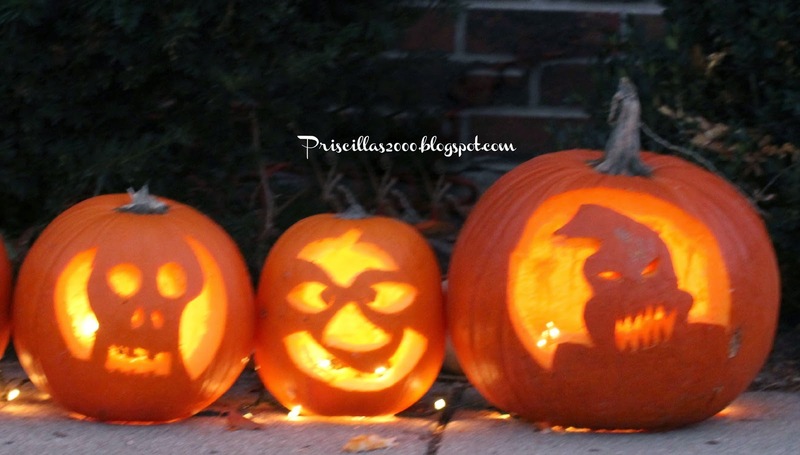 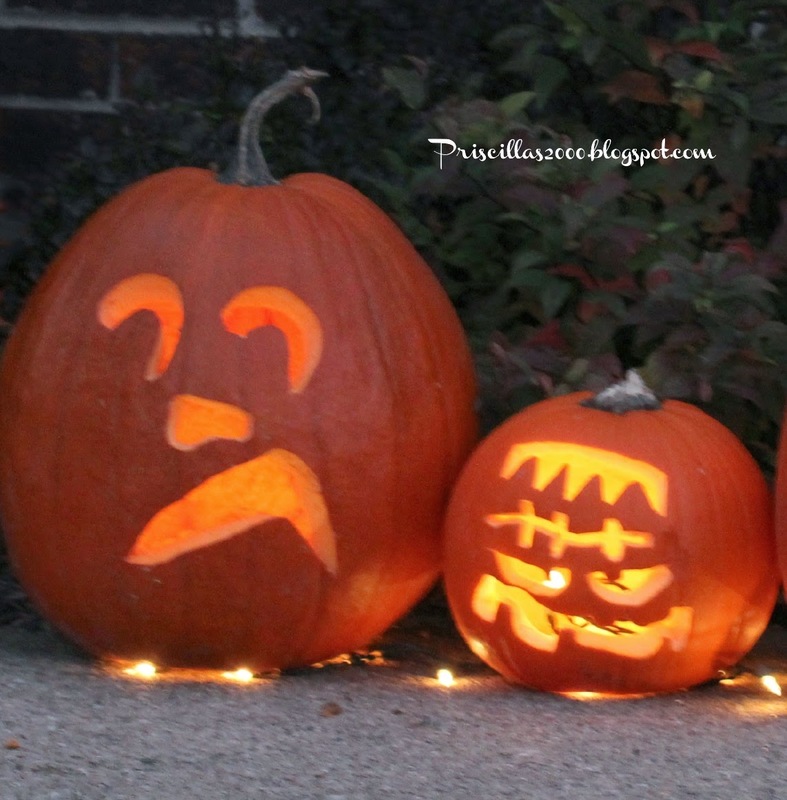 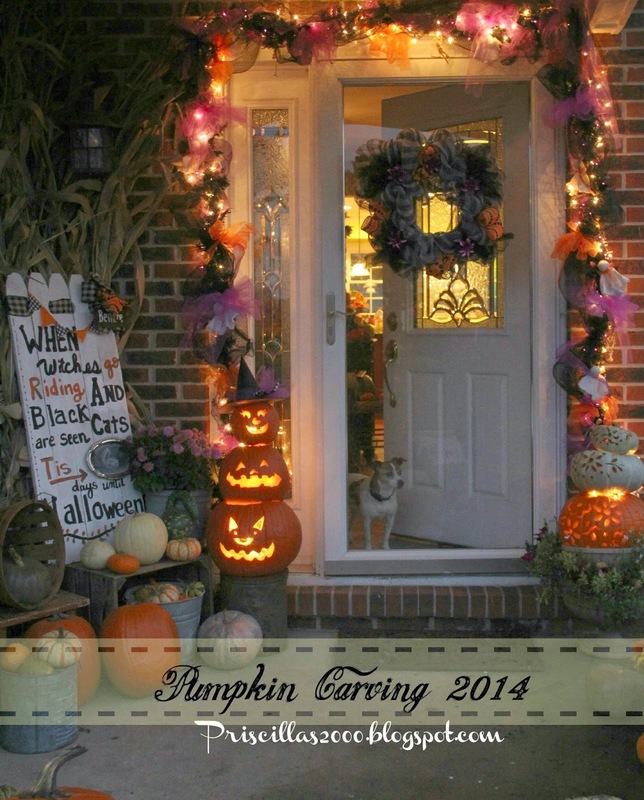 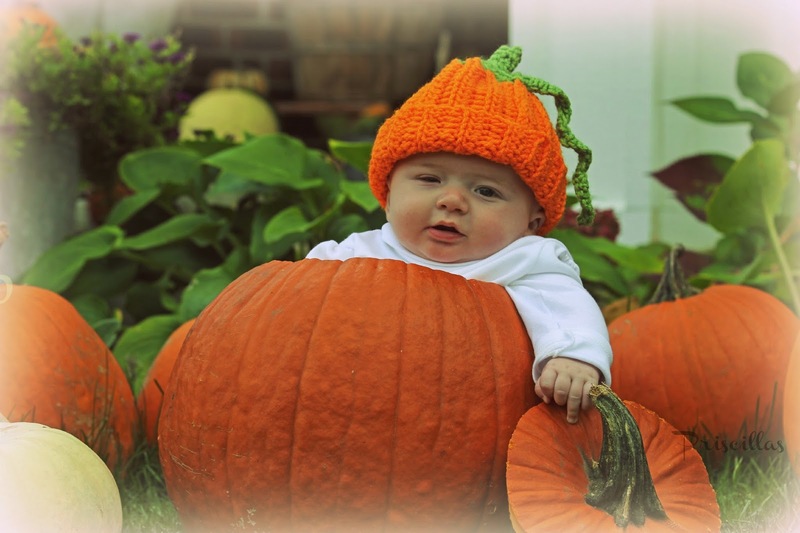 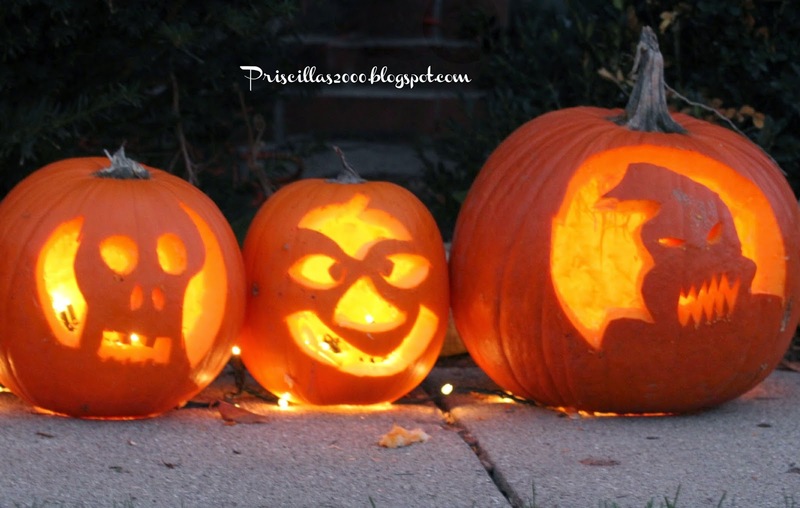 The pumpkins are carved and at night they are all lit up along with the garland surrounding the door. 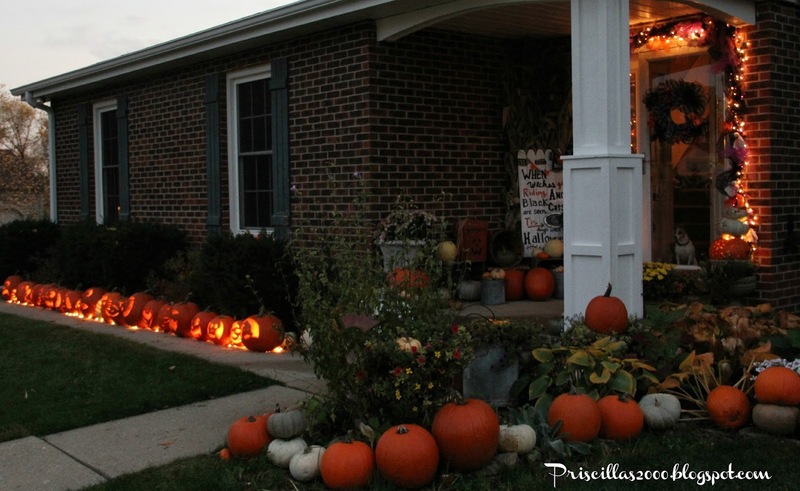 There are 22 jack-o-lanterns in that line and 6 in the topiaries by the door. 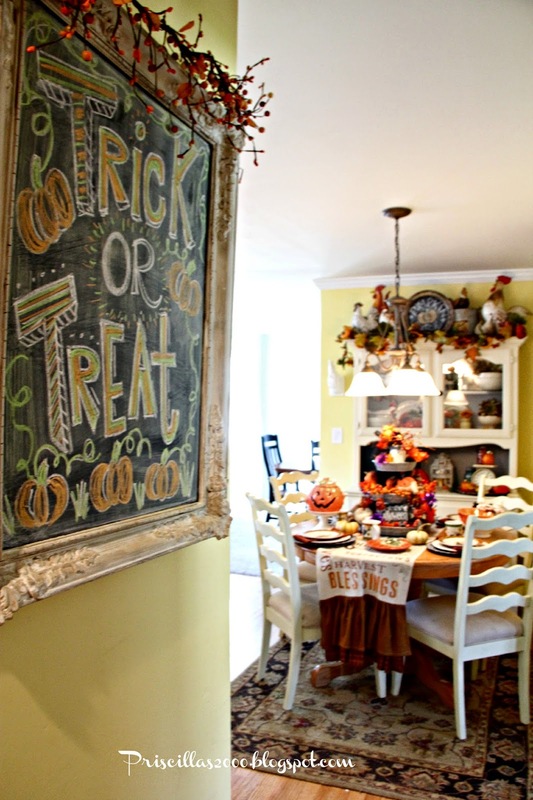 In the kitchen the star of the show is the seasonal chalkboard.. 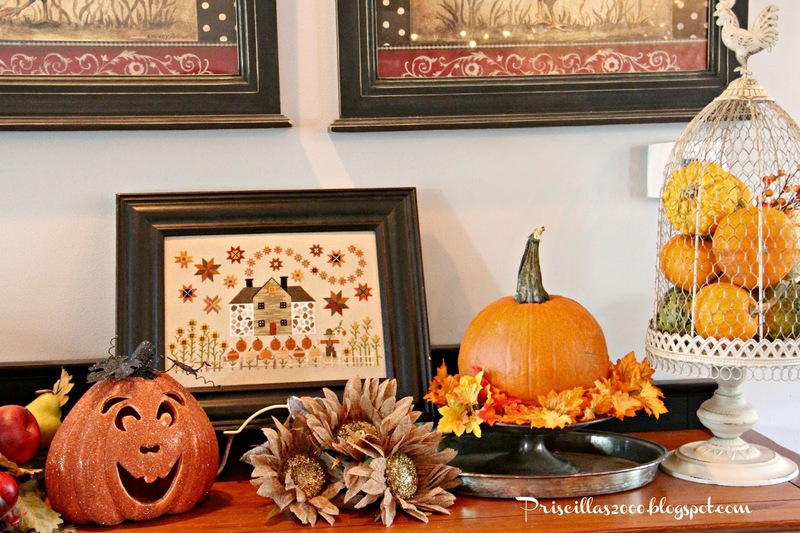 The table is set with Halloween dishes ..and the fall subway art table runner..
My favorite new cross stitch finished on a hanging metal tray ..Love Prairie Schooler ! 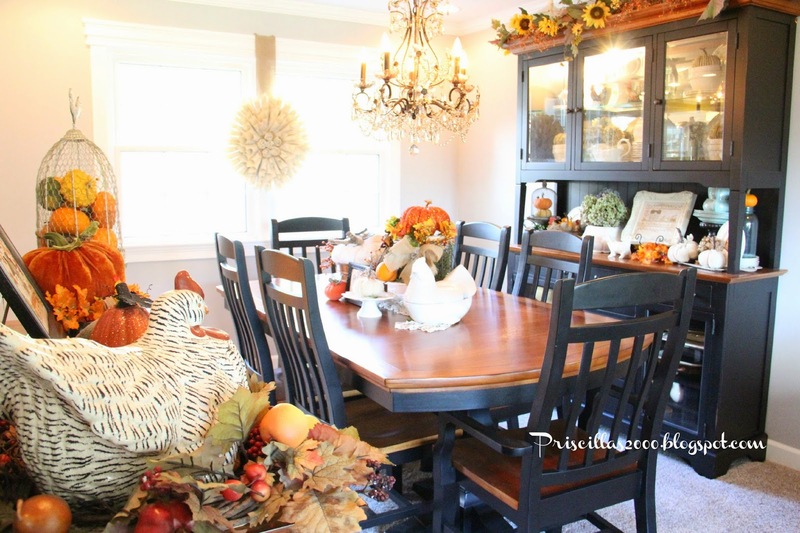 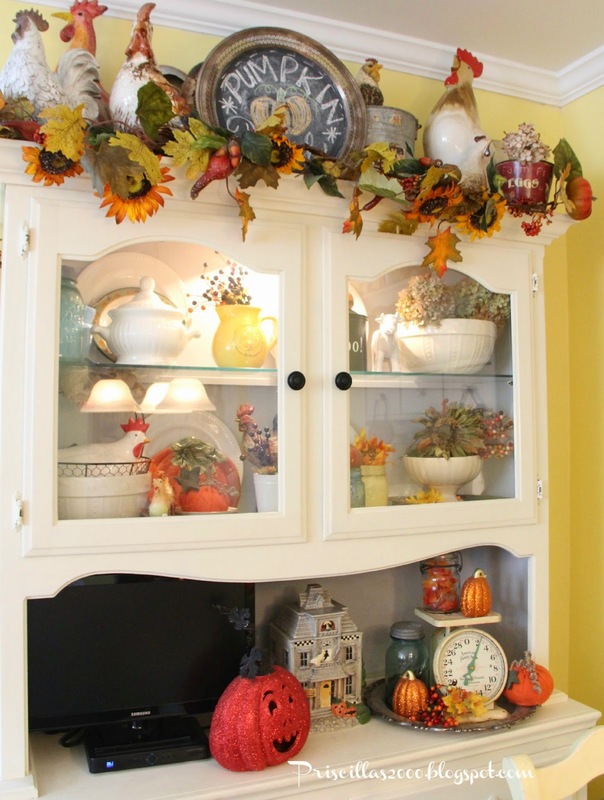 A tray painted with chalkboard paint and a fall garland sit on top of the hutch with all the chickens.. 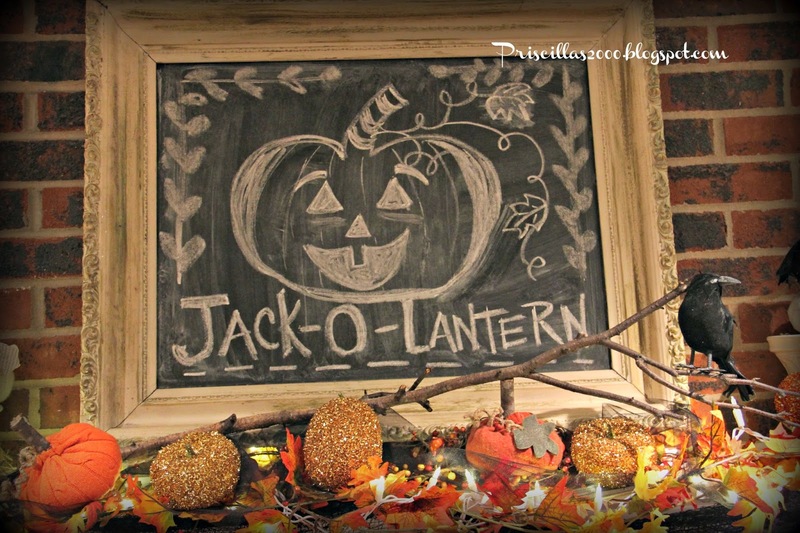 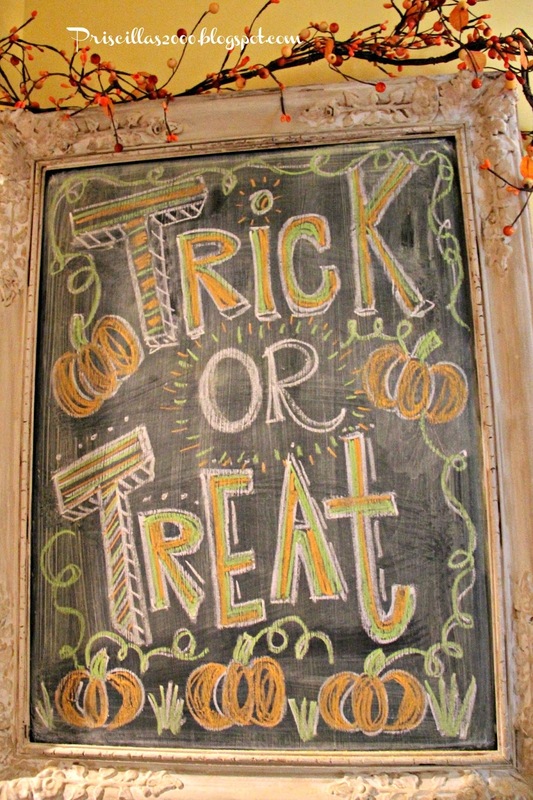 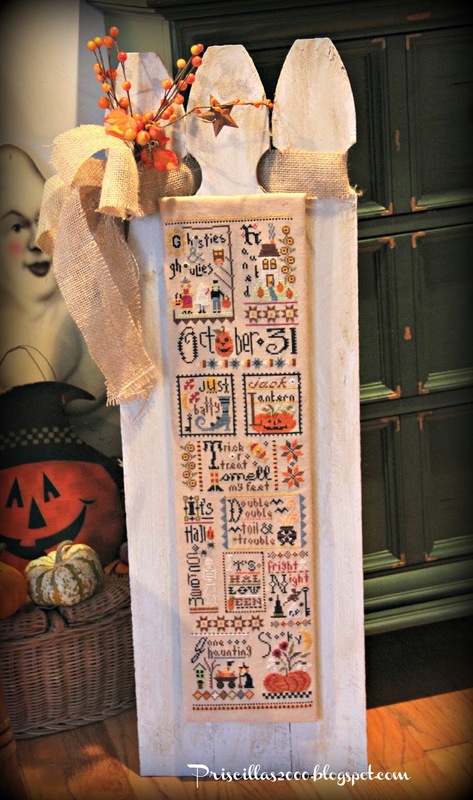 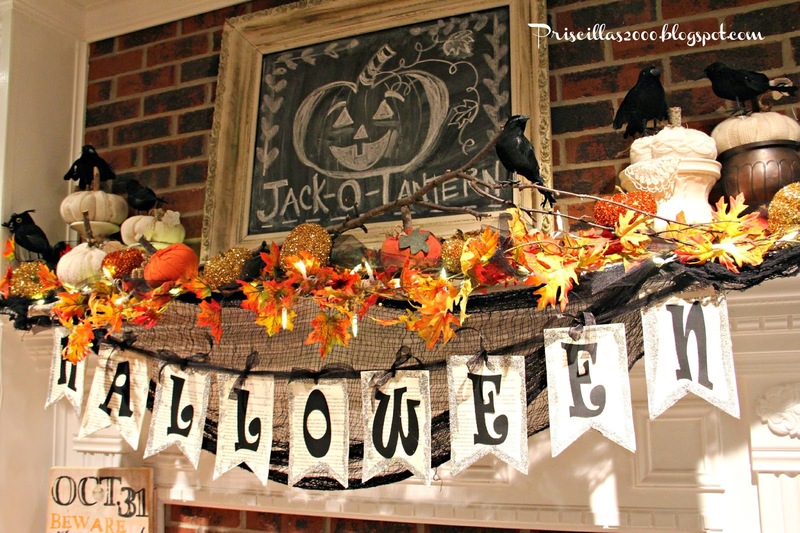 The galvanized tiered tray is filled with Halloween goodies! 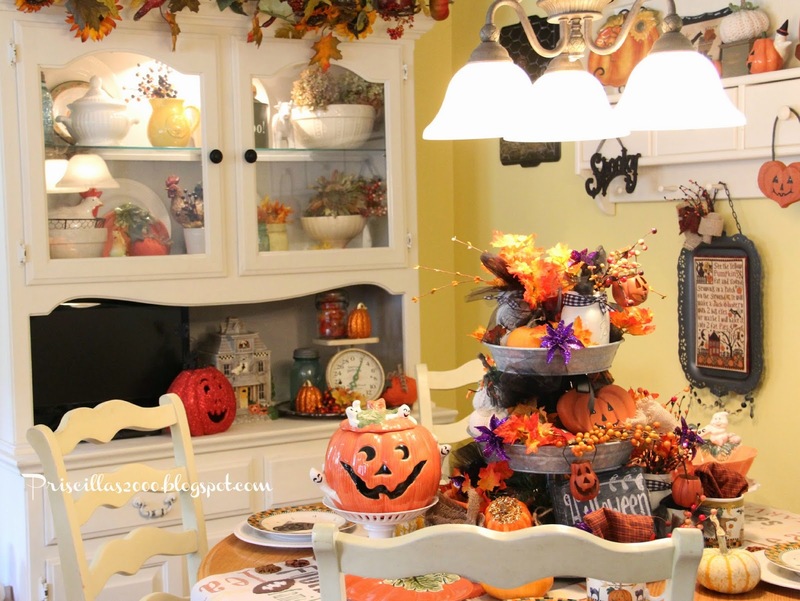 The dining room has touches of Halloween on the buffet , hutch and table..
On the buffet ..love the cloche filled with gourds. 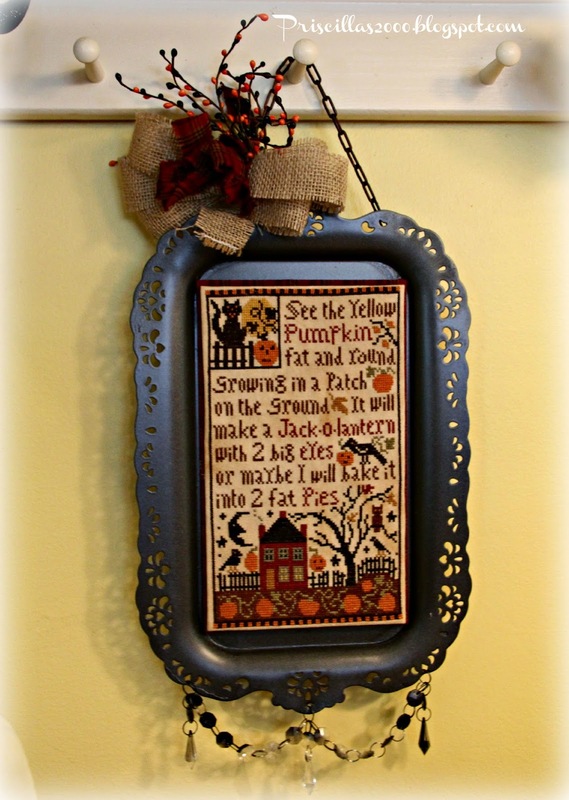 Plum Street Samplers Cinnamon stars cross stitch is another of my favorite pieces ! 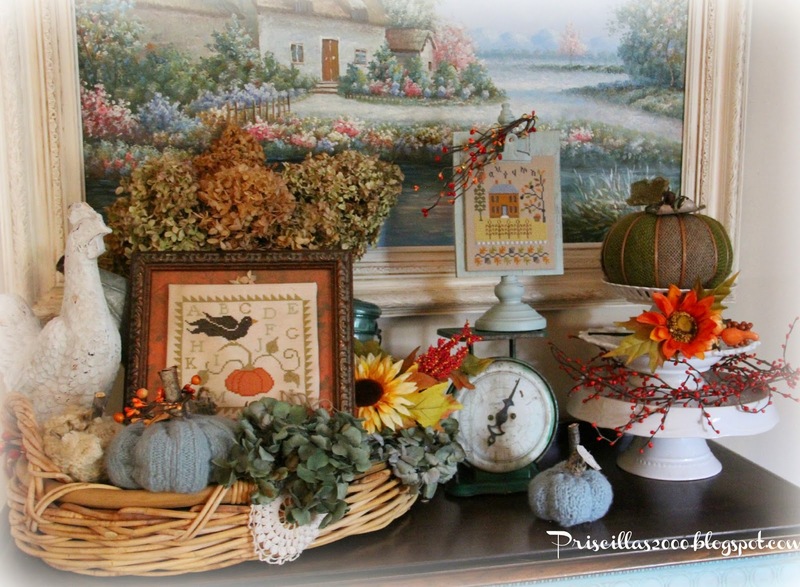 On the table...sweater pumpkins, stitching ,glitter pumpkins and a chicken soup tureen .. 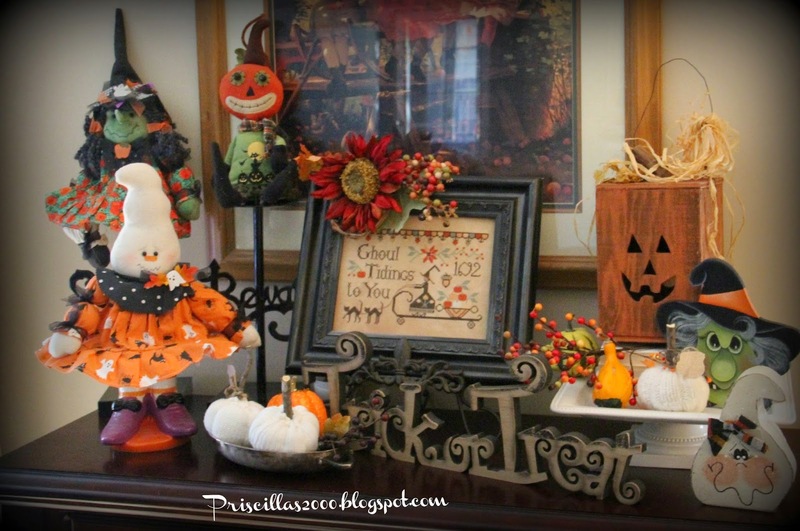 The foyer has another Prairie Schooler piece.. pumpkins, vintage scale holding mini pumpkins..and a book page pumpkin. 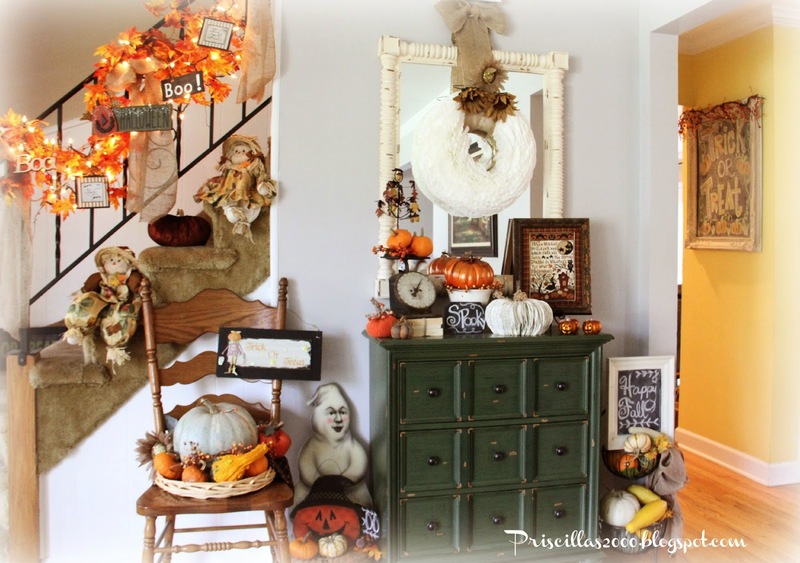 The stairs have fall leaf garlands and white lights ..
A table in the family room with more Halloween goodies .. witches , a ghost , stitching and more sweater pumpkins.. 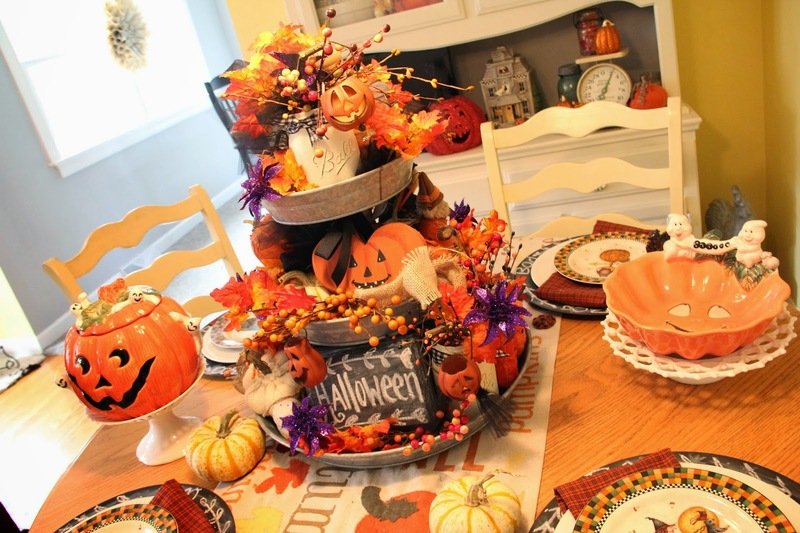 The aqua buffet in the family room has some fall stitching pieces, vintage scale , and a stack of white pedestal plates..
Hope you all have wonderful halloween celebrations ! 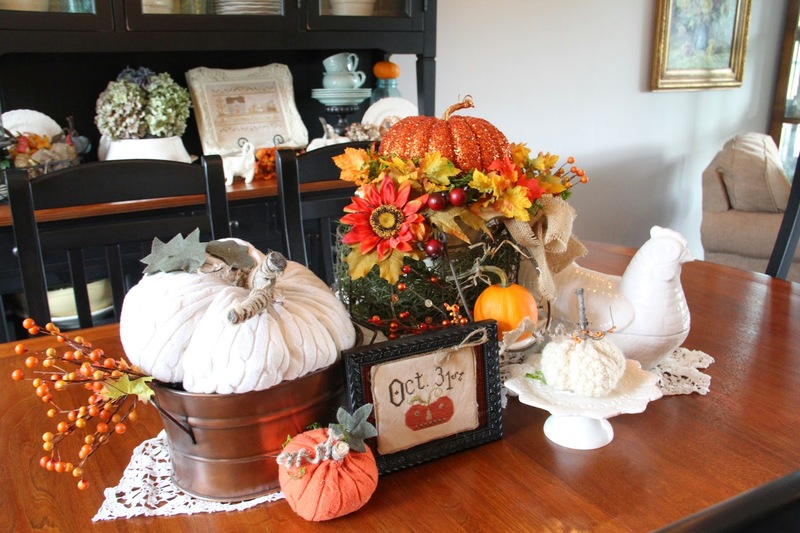 The Christmas decorating starts here this weekend ! 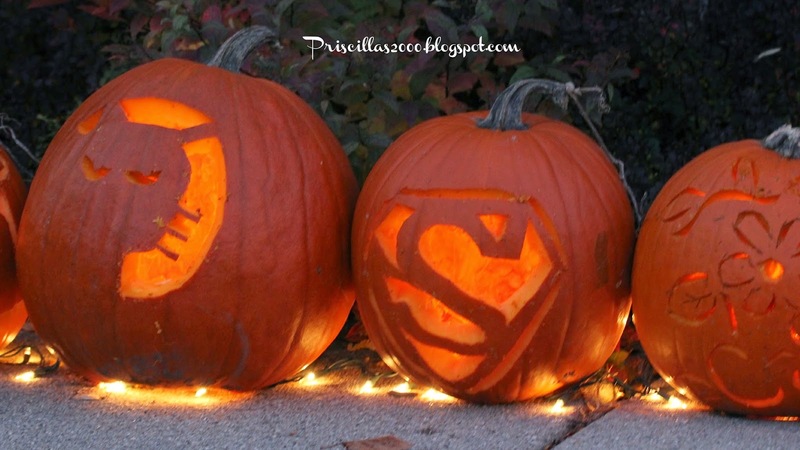 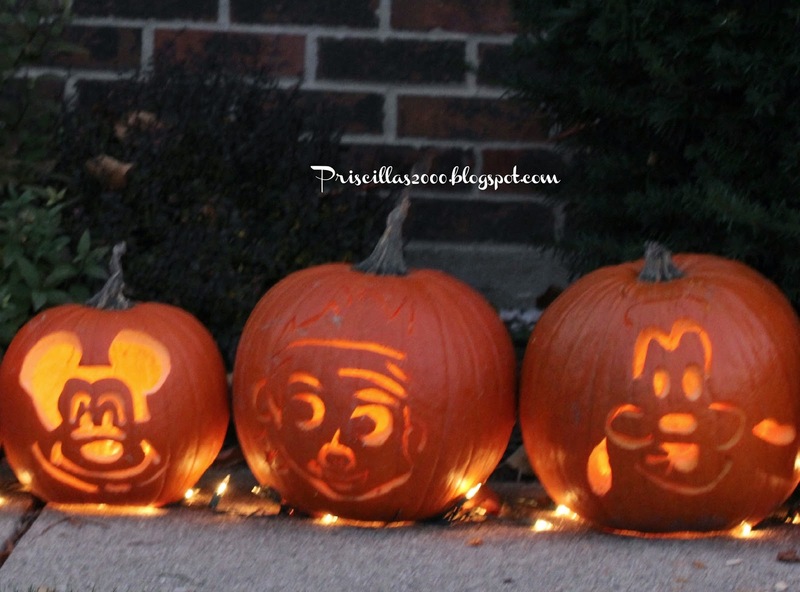 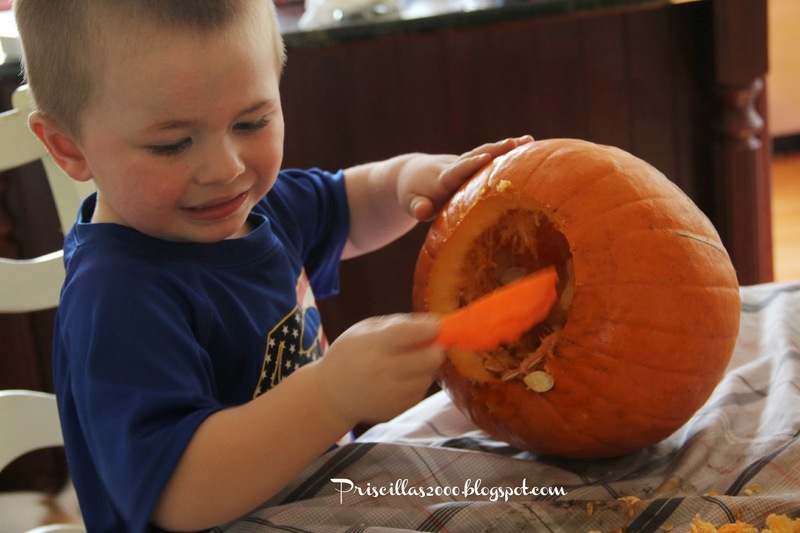 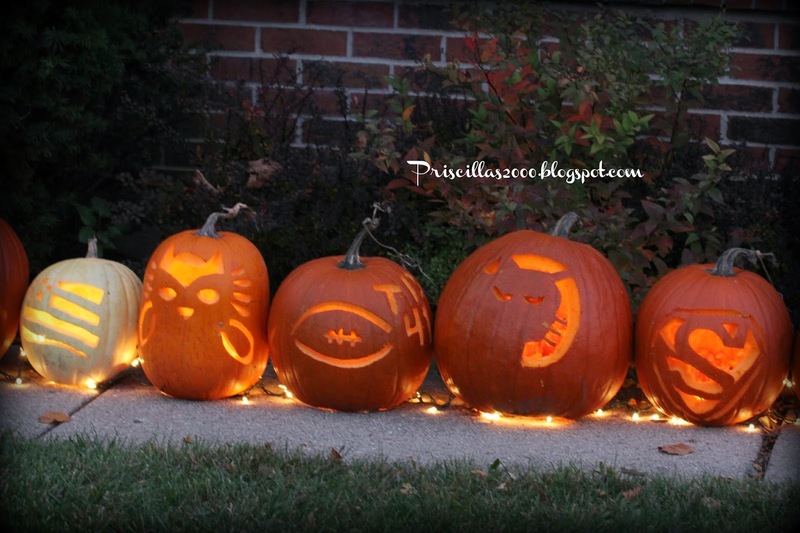 This weekend a lot of pumpkins got carved ! 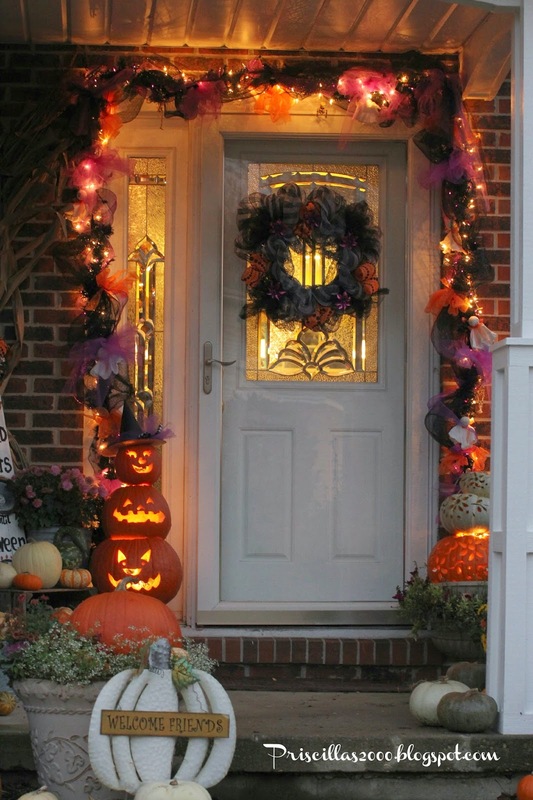 On each side of the door are a stack of three carved pumpkins..
Skeleton, jack o lantern, ghost. 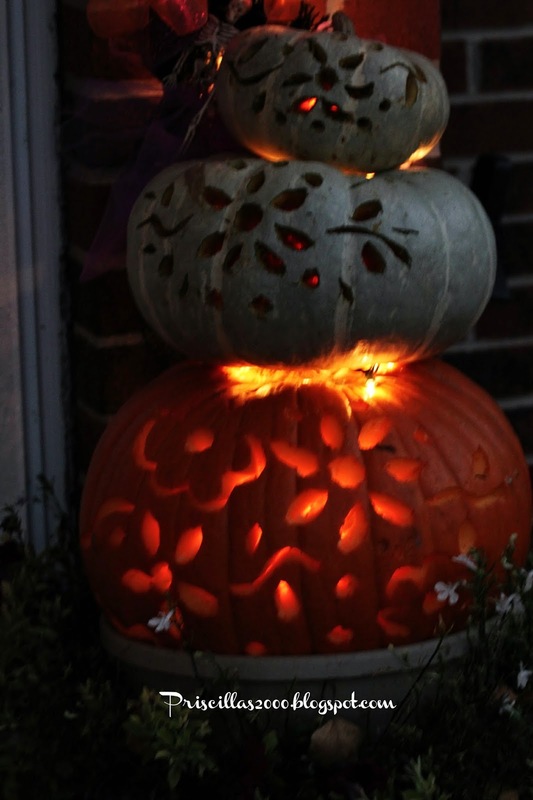 The cat, Superman, flowers, the big pumpkin with a little pumpkin in his mouth..
Love this topiary with flowers and vines.. Those blue pumpkins are a little hard to carve . 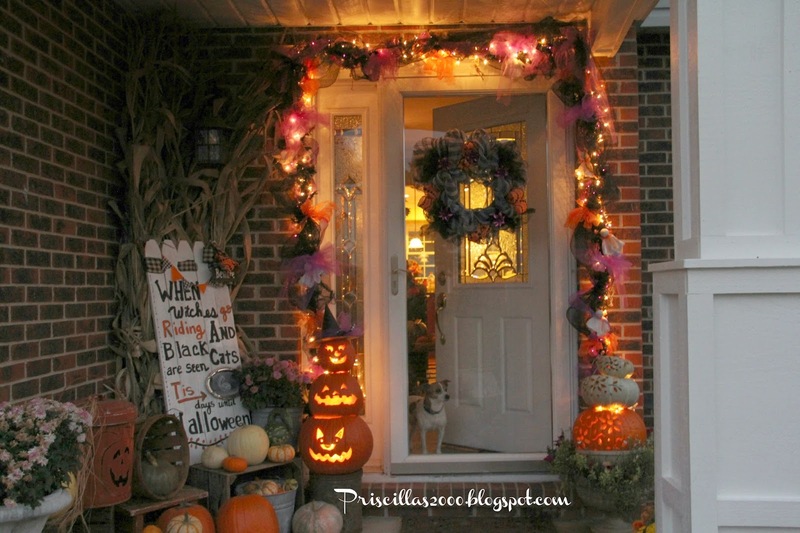 We use Christmas lights wadded up and stuffed insude to light them up. 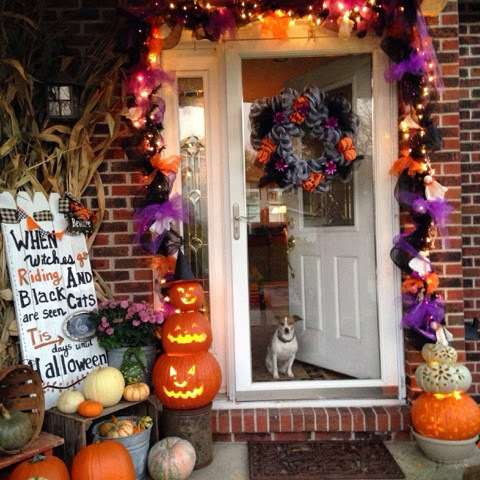 We are all ready for Halloween .. Just need the Trick or Treaters !